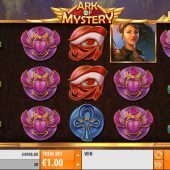 Ark of Mystery slot takes us exploring ancient Egyptian temples in much the same way the Novomatic Book of Ra does, only this time our intrepid explorer is a female and doesn't wear the hat as it would ruin her hairdo. Given the Egyptian iconography it's rather odd that the pillars behind the reels have ferns by them of the kind that you may find in a jungle-based temple game such as Aztec Idols as opposed to the desert! You do get some dramatic Egyptian music as you spin though and this gets very loud when wins appear to set the scary atmosphere quite well, but is opening this Ark likely to release the Pharaoh's curse on our bankroll? As with a few Quickspin slots of late such as Big Bot Crew and Volcano Riches we have what you may term a 'low-tech' game where all the action occurs in the base game and there is no dedicated bonus round. This actually isn't a bad thing here when we examine the mechanic found in Ark of Mystery slot. 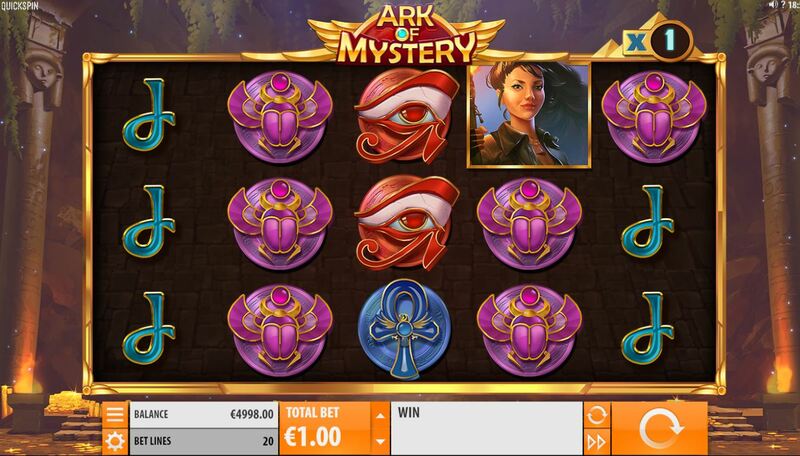 We get 5 reels of 3 rows with 20 paying lines and stacked symbols and these can pay quite well; the highest 5-of-a-kind is the Lady Explorer at 50x bet, the Eye Of Horus 12x, Scarab or Ankh 6x and five card values at either 3 or 2x. All very simple thus far, but what secrets does the Ark have in store for us? Before we reveal the secrets of these Golden Arks, there is a stack of 3 Pyramids that appears on reel 5. Each landing in view adds a 1x multiplier to the win on that spin so all 3 in view would make it 4x. The Golden Arks are Wild and can only appear on reels 2, 3 and 4 and they stick for respins but this is very different to Starburst's model because they only expand one tile at a time. So if one lands on reel 3 say, any pays are calculated and it then expands to cover just one more tile and if any wins occur these are added before you get a final spin with it fully expanded then the total win is paid. If at any time you see another Wild Ark land during this, you won't lose the fully expanded reel until the second Wild has fully expanded and disappears. Depending on the sequence of the Arks appearing this means you can get up to 6 respins in total, the last being with all 3 centre reels Wild. Oh yeah, did I forget to mention that Pyramid Multiplier on reel 5? Well unlike during a normal spin, any Pyramids appearing during the respinning sequence will be added to a total above reel 5. This means it's possible to get all three in view on the initial Wild appearance and all 6 subsequent respins thus awarding up to a 22x multiplier on the final respin! It's not a Wild itself so any lines it covers can only pay 4-of-a-kind but the multiplier will always ensure that this will pay more than a 5-of-a-kind anyway. Theoretically you could win in excess of 10,000x bet if the respins went well for you!